Julia Citron, Techfugees Education advisor, set out to compile a database of refugee education initiatives to help innovators discover what’s already out there. Find out more about how she carried out the research and see her 15-question checklist for innovators in education looking to help refugees. As a result of your research, you’ve put together 15 questions to help define refugee learner groups and a database of education initiatives. What led you to carry out the research? Like so many people, I saw the news and wanted to help. Last, year I set up a blended learning programme for maths and science teachers who were stuck in the collapsed Spanish economy and wanted to come to the UK to start a better life. 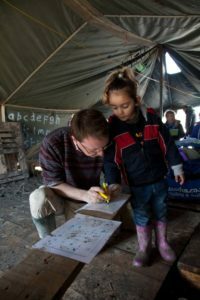 I wondered whether there might be scope to design digital learning programmes for refugee children and adults that would be flexible enough for them to access on the go and with very few resources. To find out more about the context, I visited a refugee camp in Calais. What were your initial findings? That the landscape for refugee learning was even more complex than I’d anticipated. 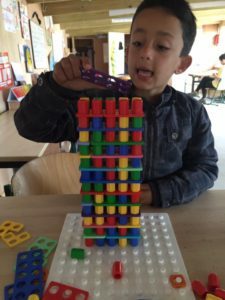 Some children had good English, others had none, some families had means, others were deep in debt, some looking to settle in France, others were in transition, some children had smartphones, others didn’t – all factors which would affect what truly accessible and relevant education might look like for them. The complexity of refugee’s contexts has been a challenge for innovators across the world tackling the crisis. 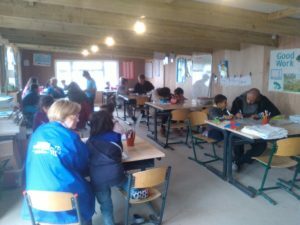 In Calais, I saw several initiatives set up by passionate individuals and organisations which were having a strong impact on the users they reaching. However, many more potential users weren’t able to truly access what they were offering due to invisible barriers – from unsafe streets in the camp stopping girls leaving the house to children busy sleeping through the days after spending long nights trying to get on lorries. The more I researched refugee education initiatives, the more found this pattern – apps built at hackathons which weren’t being adopted, groups of children ineligible to access schooling programmes as their UNHCR papers were out of date. Unanticipated issues which were stopping groups of users from accessing the services and tools which on the surface seemed available to them. 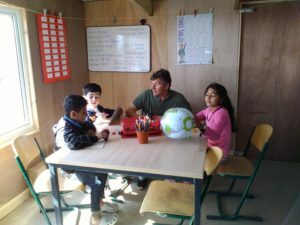 Desk research and a visit to a refugee camp in Calais. The research was carried out in my spare time over 3-4 months. Who could use your research and how? Donors could use the 15 questions to map the refugee education space and identify underfunded niches. What are the problems you hope your research will help solve? Organizations investing time, effort and money but failing to have an impact on as many people as they could because they haven’t taken account of the diversity of their users’ needs. Projects being less successful than they could as actors haven’t learnt from similar previous experiences. Niches of people with unique sets of needs (e.g. : minority languages) whose needs are being overlooked. Organisations spending unnecessary time on desk research when they could be taking action. What initiatives are already out there? What are they trying to achieve and who are they helping? What were your key findings having completed the research? Although many refugees have smartphones, there is far from consistently one per family member including all children and internet access is often unreliable and expensive. I think connectivity is a big part of the puzzle. What would your message be to education innovators? Go for it but co-create with end users from day 1. According to Save The Children, at least 3.5 million refugee children are out of education. Millions more are in inadequate, overstretched school systems unable to meet their needs. Although camps only represent a small part of the world refugee population, the average time spent in a camp is 17 years – more working solutions are needed. As well as children’s education, every displaced adult is in need of re-training for work and integration in their new country. The complexity of refugees’ situation means that there are multiple groups of people with distinct needs looking for unique solutions. Lots of room for innovation! I’d like to share the research with innovators, ed-tech organisations and funders in the space. share the research with people who might find it helpful! Where can I find the database of initiatives?